Beautiful handwriting is an expression of personality and individuality. It is the writer´s own, unmistakable hallmark. Handwritten letters, congratulations, invitations, place cards, menus, certificates, programmes and the like invariably seem more personal. 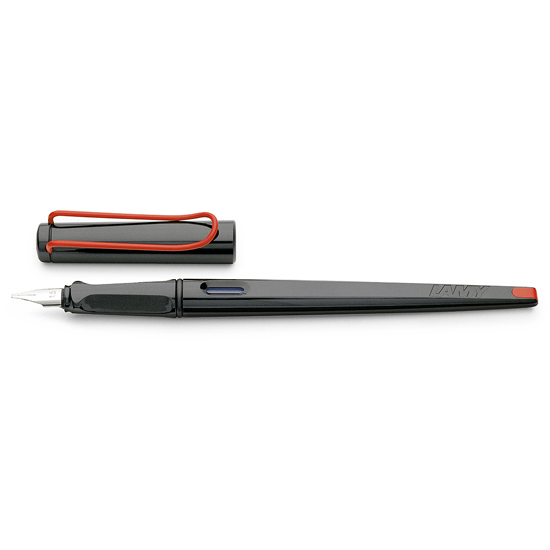 Now there is the ideal writing instrument - the LAMY joy, a fountain-pen that inspires beautiful, creative writing. Thanks to its ergonomic design, it sits comfortably in the hand. Made of black shiny plastic. Ergonomic grip section and flexible clip of spring brass wire. Cartridge filling system with ink cartridge T 10 blue (can be modified for use with converter Z 24). Stainless steel nib with 1.1, 1.5 or 1.9 mm chisel point. Copyright © 2019 Montgomerypens.com. All rights reserved.